To view our current inventory of antique British Royal Navy Uniforms, medals and accoutrements, click here! 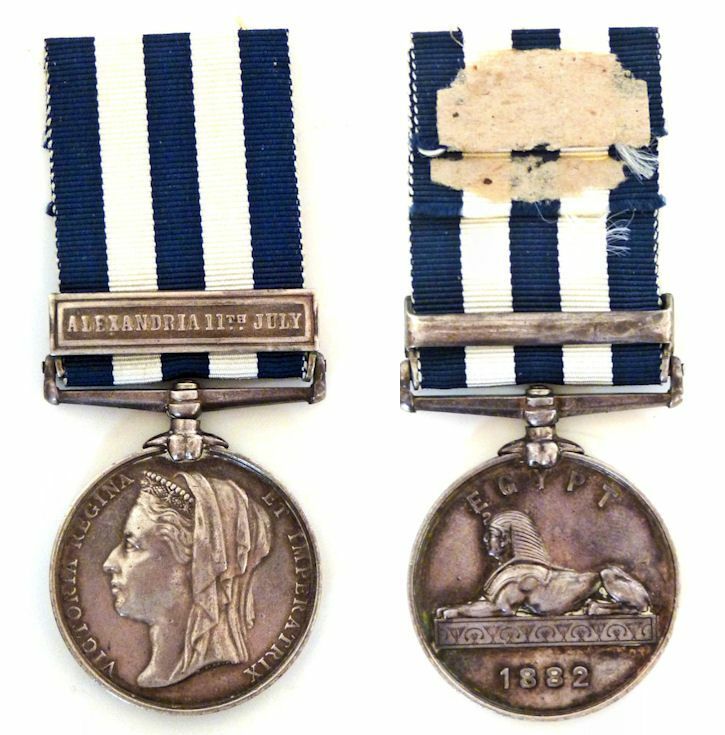 Presented is a fine example of the Battle of Egypt Medal of 1892 with Alexandria bar, that was awarded to Petty Officer J.H. 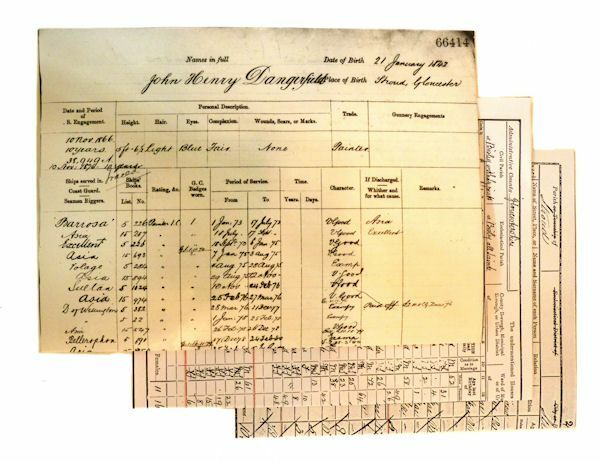 Dangerfield, 1st Class Painter on board HMS PENELOPE, and dated July 11th, 1882. 6. 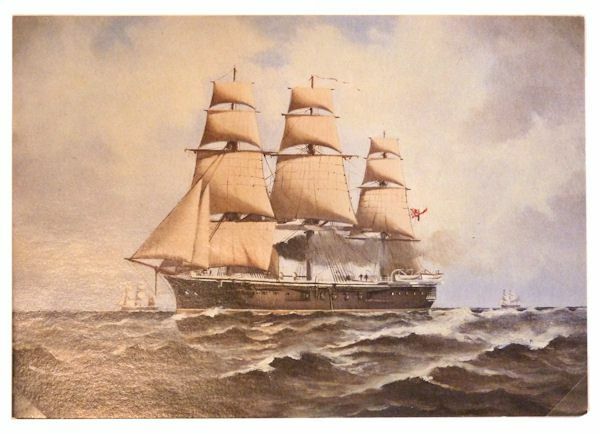 Printed article about HMS VOLAGE another ship in which Dangerfield served. BATTLE OF EGYPT MEDAL - ALEXANDRIA: The medal has its ribbon of alternating white with blue stripes. It was awarded for service in various naval actions from 1882 to 1885. 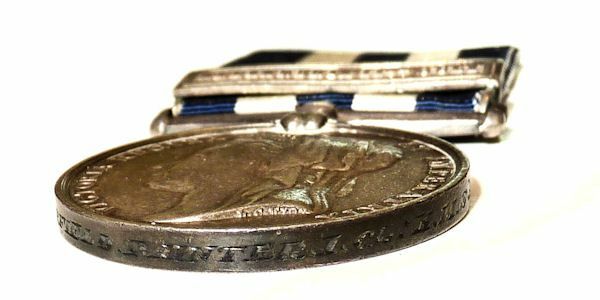 The Naval General Service Medal was originally approved in 1847 for issue to officers and men of the Royal Navy retroactively. DESCRIPTION of this MEDAL: The obverse has the head of Queen Victoria and the legend 'VICTORIA REGINA ET IMPERATRIX'. The reverse depicts a sphinx facing left with the word 'EGYPT' above and '1882' in the exergue below. After 1882, awards were identical but with the 1882 date being omitted. The suspender is straight with a claw mount sweated to the medal. The reverse has the symbol of a prone Sphinx with EGYPT above and the year 1882 below. The second version was the same but without the "1882" engagement. These medals were issued to only 4592 men. The Egyptian Medal was issued 1882-1889. On the edge of the medal, the recipient's number, rank, name, ship or station are engraved along the edge. SPECIFICATIONS: Silver disk 36mm in diameter with swivel clasp and alternating white ribbon and blue stripes 32mm in length. CONDITION: The back of the ribbon has remnants of paper and is missing its safety pin. Otherwise it is fine condition with a nice patina of age. 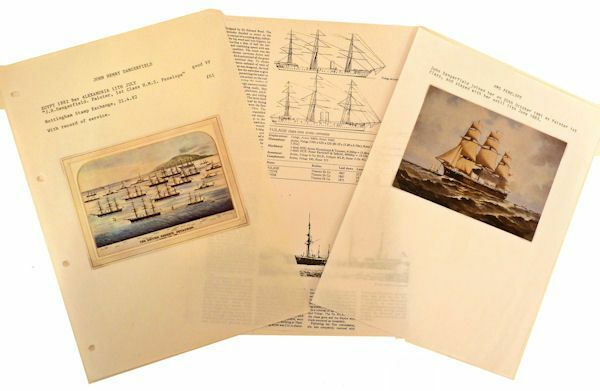 The accompanying documents are all in good condition. THE EGYPTIAN WAR: The war erupted after the opening of the Suez Canal in 1869. Foreign armies mutinied and triggered an anti-European uprising in 1882. On July 11, 1882 HMS Alexandra, flagship of the Mediterranean Fleet, fired the opening shot of the lengthy Egypt/Soudan war. The causes of the war, like all wars, was mainly political, & was one in another of the many Colonial wars & conflicts during Queen Victoria’s long reign. Many times Britain had to come to the aid of an inept or tyrannical ruler, or was required to take naval or military actions to protect her vast colonial empire & the essential sea routes that made that empire possible. The Suez Canal was of great importance to Britain & played a very large part in the important & necessity of keeping both Egypt & the Soudan politically stable & friendly towards British interests. The troubles in Egypt with fanatical religious leaders was to keep Britain’s naval & military resources well occupied for most the of the 1880’s decade. Thanks to http://www.britishmedals.us/collections/BW/nbes/intro.html Pictured to the left are some of documents that accompany the medal.